Your face is one of the most distinct features of your entire appearance. When someone thinks about you, it is your face that first comes to mind. If there are certain features about your face that you are unhappy with, this may make you feel even more self-conscious. Luckily today, there has been much advancement in facial plastic surgery so that people who wish to alter the appearance of their face can do so very successfully. Chin augmentation is a relatively simple, yet often overlooked procedure than can greatly affect a person’s facial appearance. A person’s profile is significantly effected by a person’s nose and chin – both separately and the relationship between the two features. There is a desired balance needed between the nose and the chin in order to create a balanced profile and an overall balanced appearance. A weak chin can cause a person’s nose to look considerably larger than it actually is because it does not balance with the protrusion of the nose. 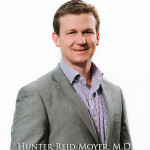 A weak chin can also cause the jaw line to “disappear” and make the neck appear fleshy. Chin augmentation can bring the facial features into harmony and create a beautiful and polished overall facial structure. The best candidates for chin augmentation are those who have a recessed chin, a fleshy neck, a pointed or squared chin, or a prominent nose. Chin augmentation adds definition to the jaw line and balance to the face, which cannot only drastically alter a person’s appearance, but it can also take years off a person’s face. Chin augmentation is often an overlooked procedure because many people do not realize the significant impact that it can have on their facial appearance. 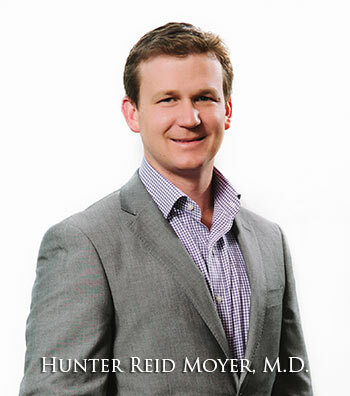 If you are interested in receiving more information about chin augmentation and to determine if this surgical procedure is right for achieving your goals, please contact Hunter R. Moyer, MD today. During your consultation, we will discuss how chin augmentation can enhance your facial appearance in order to achieve the results you desire.